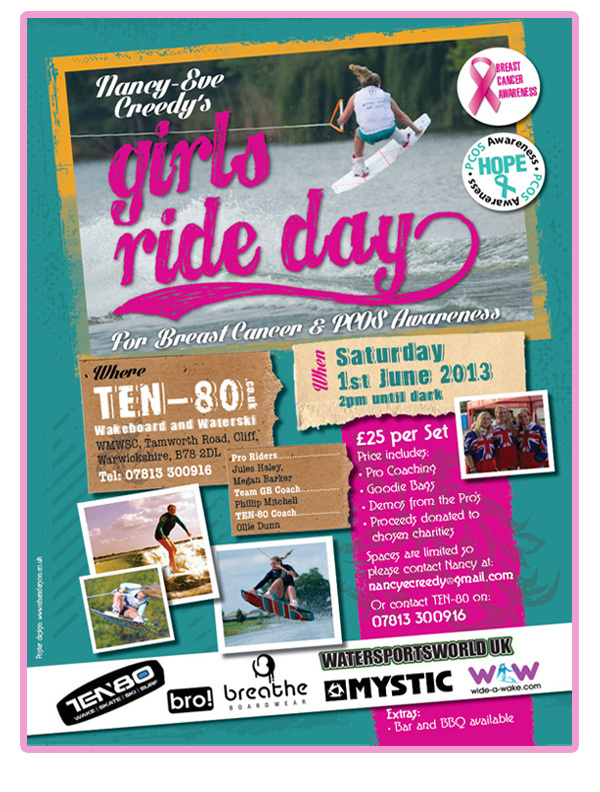 Support Nancy-Eve Creedy's Girls Ride Day for Breast Cancer and PCOS Awareness, on Saturday 1st June 2013. The competition will be held at TEN-80 Wakeboard and Water Ski, WMWSC , Tamworth Road, Cliff, Warwickshire, B78 2DL. 2pm till Dark. Each set is Â£25 for 15 minutes and you will be coached by some of the UK's top female riders, alongside Phillip Mitchell who has coached many International and National podium winners over the years.The girls will also be out on the water during the day for a Pro Demo . Watch Megan Barker who just grabbed 6th at the World Cup of wakeboarding and Jules Haley Former National Champ Throw it Down. Every girl who rides will also receive a goody bag featuring treats from WaterSports World UK, Mystic, Bro! Clothing, Breathe Boardwear, V05 and Tresemme. Not a water babe? That's fine we have something for everyone with a Bar and BBQ available on the Day. We will also have DJ's on hand so you can have a dance till the sun goes down. Manicures and massages are available for those looking for the ultimate in chilled out luxury. All profits from the day will be split equally between the PCOS foundation and Breast Cancer Care charities that are both close to my heart. Ride, eat, drink, dance and help me raise money and awareness for Breast Cancer and PCOS!